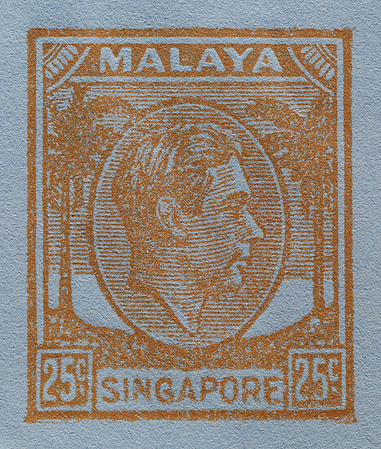 The Singapore 25 cents was the one and only coconut definitive where erroneous preparation of the single-plate Die II for a bicolour was followed by erasure of the medallion from the die and subsequent use of a Die I key plate, producing the unique Die III (Stanway 2009). Unlike Die I, the background lines of the duty plate do not intrude into the medallion past its rim if the medallion is well-registered as in this example. "Issued" by the author to commemorate the historic face-to-face meeting between North Korean Supreme Leader Kim Jong Un and US President Donald Trump on 12 June 2018. 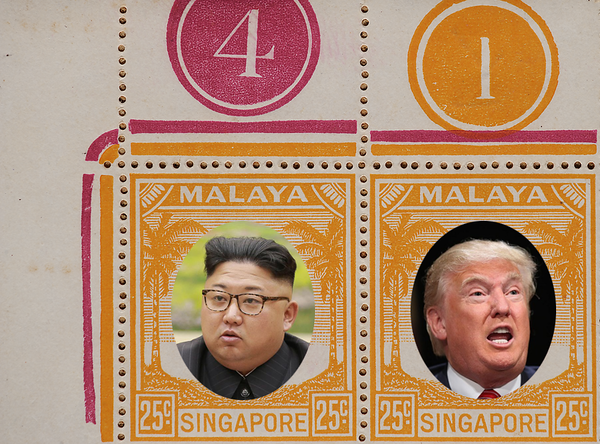 The Singapore 25 cents didn't stop at Die III. In 1951, it became the only instance of the coconut definitive ever printed directly on aerogramme paper, by English printers McCorquodale, which took over the postal stationery contract from De La Rue in 1954 (Stanway 2009, Holley 2010b). 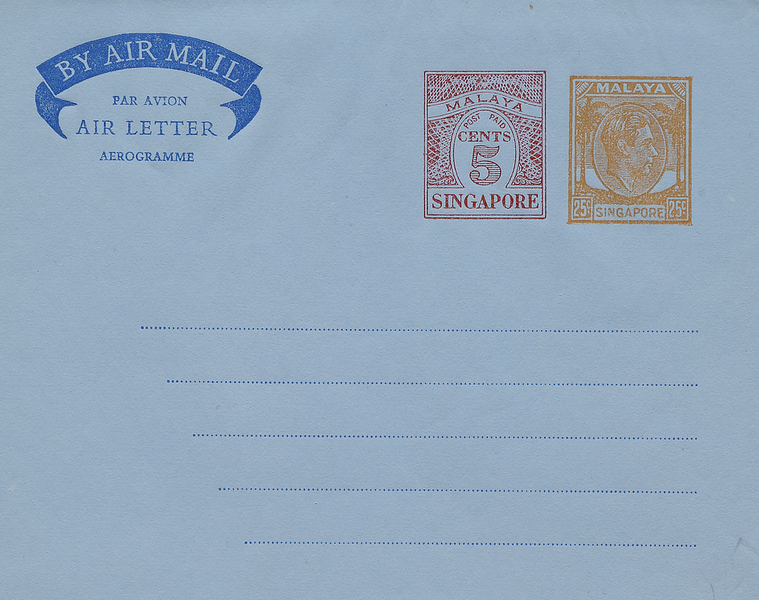 Holley (1987) discusses the postal history behind these aerogrammes. The imprint appears to be from a photographic reproduction of a Die III stamp, all the more likely given that McCorquodale probably had no access to the original plates. Like Die III, the medallion rim here is touched by all parts of the surrounding design but not breached. Its inferiority to letterpress and even to forgeries is evident. 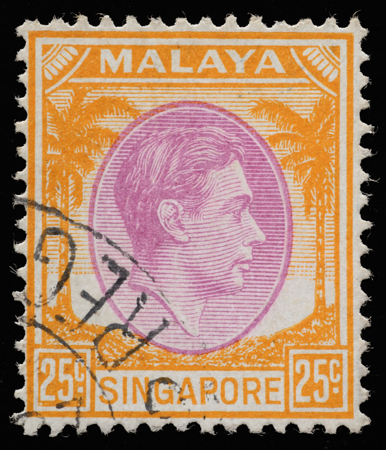 Especially so are the uneven printing of SINGAPORE, the difference in font weight between the tablets and the defective lower corners of the frame. As a whole the imprint presents a grainy texture. 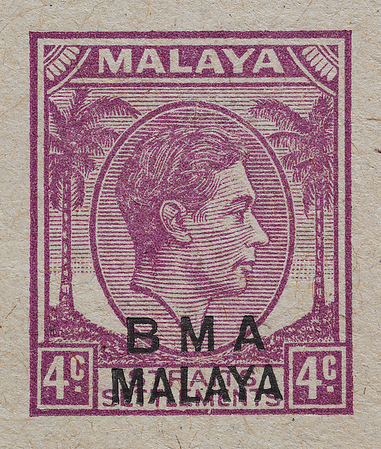 The crisp 5-cent imprint next to the coconut on the aerogramme shows that the rough paper was not responsible for the coarse print quality of the latter. Moreover, far superior coconut impressions were achieved even on the almost equally rough postal stationery card (right).